Written on 20 September 2018. Since 2006, the increase of the percentage of respondents using ETFs in traditional asset classes has been spectacular: in 2006, 45% of respondents used ETFs to invest in equities, compared with 92% in 2018. As for governments and corporate bonds, the result went from 13% and 6% in 2006, to 62% and 66%, respectively, in 2018. Satisfaction has remained at high levels especially for traditional asset classes with a significant increase in satisfaction with equity ETFs and government bonds, which now enjoy satisfaction rates of 97% and 92%, respectively. About two-thirds of respondents (67%) used ETFs to invest in Smart Beta in 2018, a considerable increase compared to 49% in 2014. Respondents most frequently use Smart Beta / Factor-Based exposures to harvest long-term premia (as opposed to tactical use). Despite this strong motivation, more than 80% of respondents invest less than 20% of their total investments in Smart Beta and Factor investing strategies. 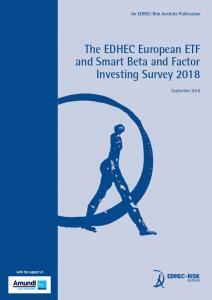 50% of investors still plan to increase their use of ETFs in the future despite the already high maturity of this market and high current adoption rates.Top concerns for the respondents are the further developments of Ethical / SRI ETFs, emerging market equity and bond ETFs and Smart Beta ETFs, including multi-factor and smart bond indices. Respondents show a significant interest for Fixed Income Smart Beta solutions and plan to increase their investment in it, but they do not consider there to be enough research in the area. The development of new products corresponding to these demands may lead to an even wider adoption of Smart Beta solutions. Commenting on the results of the survey, Fannie Wurtz, Managing Director at Amundi ETF, Indexing & Smart Beta , said, “ETFs are now broadly used and recognised as a genuine asset allocation tool, in all asset classes, as shown in this new edition of the EDHEC-Risk Institute Survey. The rising adoption in the Smart Beta and Factor field implies new challenges for asset managers, to design the right solutions that meet allocation needs, notably in fixed income factor investing field. In that context, Amundi will keep on mobilising the Group’s capacity to deepen its offering and relationships with investors”. Professor Lionel Martellini, Director of EDHEC-Risk Institute, added, “ETFs are increasingly regarded by institutional asset owners as key investment vehicles in the implementation of strategic asset and factor allocation decisions. The new frontier now is the development of meaningful smart factor investment solutions in the fixed income space. More academic research is needed in this area, which has become one of the main areas of focus for EDHEC-Risk Institute”.